The Prince of Wales visited Norwich today to see a working example of the Beauty-In-My-Backyard (BIMBY) toolkit initiative, which has been put together by The Prince’s Foundation for Building Community, one of The Prince’s Charities. The Prince’s Foundation for Building Community believes that sustainably planned, built and maintained communities improves people’s quality of life. The BIMBY initiative helps communities in the UK have a say in how their area is developed by engaging with planners and developers through the use of an online toolkit. His Royal Highness met with architects, supporters and local residents who had used the toolkit in their Norwich community. 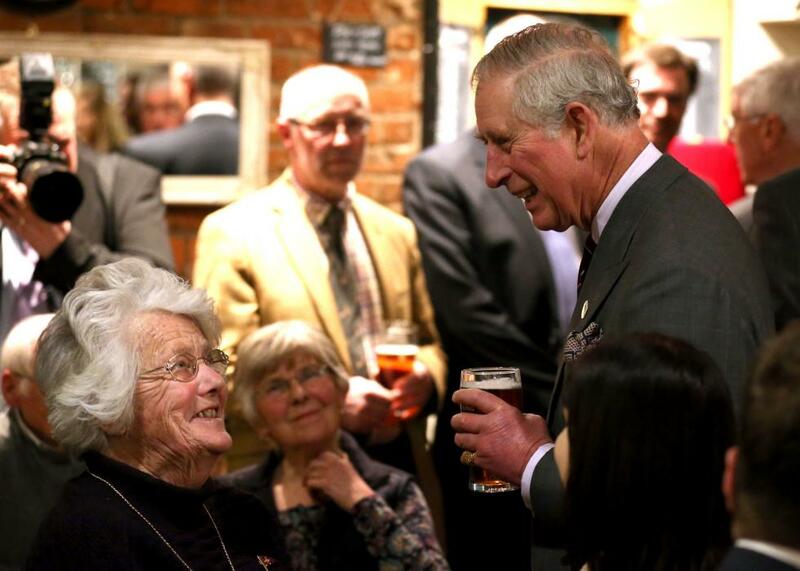 Later, The Prince spent time at The White Horse pub in the village of Upton, which had been saved from closure with the help of a grant from The Prince’s Countryside Fund. The pub is the first community-owned pub in Norfolk, and has recently opened a village shop using a grant from The Pub is the Hub, an organisation that believes pubs should be hubs of community life. Previously, there had not been a shop in the village of Upton for over a decade. The Prince of Wales talks to pub customer Maurice at the community-owned The White Horse in the village of Upton, near #Norwich. Maurice has been visiting the pub for over 70 years. The White Horse once faced closure, but it was bought with help from @countrysidefund and has recently opened a community shop, which is staffed by some 25 volunteers. While at the The White Horse, HRH toured the new shop and met with staff and customers. He spent some time with Maurice Parker, an Upton resident who has been visiting the pub for over 70 years. The Prince’s visit to The White Horse ended with the unveiling of a plaque to mark the visit, before being presented with a pub loyalty card.